1. Why do Horses Chew Wood? Nothing is more annoying than seeing your nice wood fences or barn walls turning into kindling. Trees in the pasture can also be killed by excessive chewing. There are 3 main reasons I see why horses chew wood. Mineral deficiency, boredom and stomach discomfort. Horses will eat wood in an effort to get minerals missing in the diet. Horses in the wild would have a wide range of plants to feed on to meet mineral needs not supplied by grass alone. Feeding a whole food supplement such as blue green algae is a great remedy for wood chewing in these horses. AFA algae is sourced from the mineral rich waters of Klamath Falls. Oregon. I use New Earth algae because I trust the processing of the algae and know the product is clean and free of any contaminants. Whole Pastures is another product that is made from a mix of common herbs that are nutritious to the horse. This is probably the most common cause of wood chewing. Horses are designed to graze all day with brief periods of rest. Twice daily feeding is convenient for humans but not good for horses. More frequent feeding is often difficult for people with work schedules so there are things that can be done to alleviate boredom for the horse. Slow feeder hay nets are easy to use and cause the horse to spend more time consuming his usual hay portion so he spends less time with nothing to eat. Nets with 1.5 inch holes work well for most horses. Nose it treat balls are great for horses. These can be filled with hay cubes and the horse spends time pushing them around until all the cubes are dispensed. Simple spreading the hay portion out over the paddock can increase the time required to finish it off. If your horse is not overweight you can increase his hay portion so he stays busy. Horses should get at least 2% of their body weight in feed and the biggest portion of this should be forage. Stall toys will be used by some horses. Exercise and more turnout will help horses that are bored. 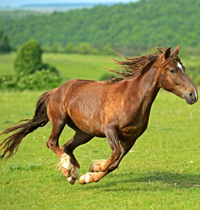 Horses produce stomach acid constantly because they are designed to be eating all day. If your horse has an upset stomach he may chew wood to generate saliva to neutralize stomach acid. Nervous horses can also have stomach issues. Chronic indigestion can plague some horses. If this is the case then evaluation of his overall diet is in order. If stomach ulcers are suspected a product such as GastroPlus Pro would be good to establish healing while the diet is being evaluated. Aloe Vera and marshmallow root are also good to support stomach health. Some wood chewing will not hurt your horse but excessive chewing can be harmful. Wrapping trees in chicken wire and putting metal protection on barn walls will deter chewing. Hot wires can be used to stop chewing on wood fences. The best plan is to remedy the underlying reason why your horse is chewing wood. Looking for holiday gifts for the horse lover on your list? Look at what Holistic Horsekeeping has to offer. From books, ebooks, Kindle books, DVD’s, and educational audios, to consults and help with temperament typing your horse, www.holistichorsekeeping.com is a great place to find holistic horse care resources to help your horse loving friends and family learn more about treating their horses holistically. We also have a very extensive listing of products that have proven themselves to be effective. By checking out the various product sections you may recognize the best choice for your horse.